2. Divide batter between 3 pans, bake for time and temperature given. 3. For the fondant icing, cream butter, add half confectioners’ sugar and lemon juice, use 1/3 cup to sandwich the cakes together. 4. For the glacé icing, beat confectioners’ sugar with water, spread evenly over top and sides of cake, keep about one fourth of mixture on one side. 5. Work remainder of confectioners’ sugar into butter icing to make a firm consistency and roll one fourth into balls for the clowns’ heads. Make a paper pattern of body parts: arms, legs, body. 6. Roll out icing on a sugared board and cut out 6 sets of shapes. 7. Tine these by paining with food colorings, using a fine brush. 8. Stick the bodies to each other and the cake with a little of the glacé icing. 9. 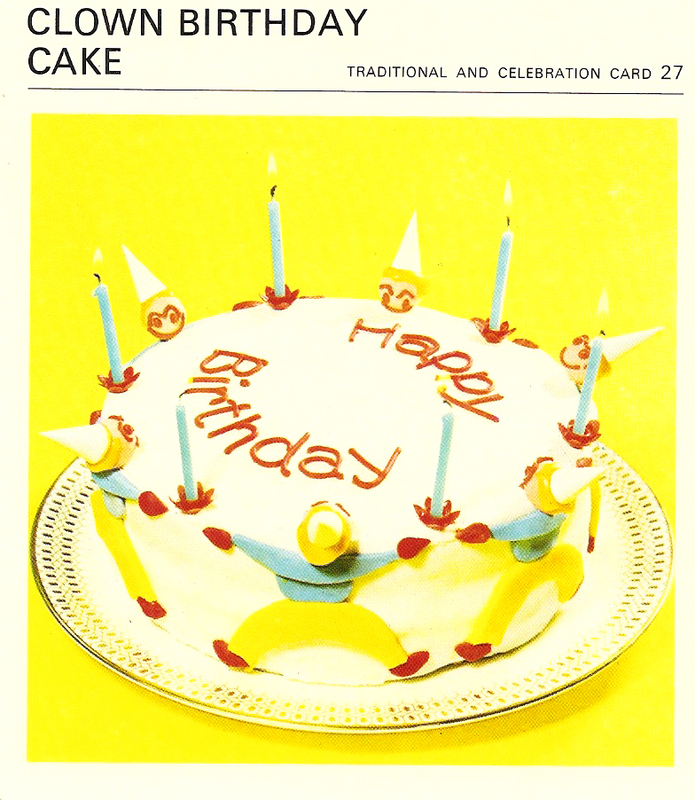 Tint remainder of icing red: make clowns’ faces – stick the heads to the cake, then make tiny conical paper hats, place in position. Pipe greetings in red too. Arrange candles in holders around the edge of the cake. 1. Cream together the margarine and sugar until soft and light, add the lemon rind. 2. Gradually beat in the eggs, adding a little sifted flour if the mixture shows signs of curdling. 3. Fold in the rest of the flour; if the eggs are small add 2 teaspoons water (lemon juice could be used).